Display scaled and labeled colorbar below each figure. Plot radar radial images as coordinate maps in Cartopy and label with lat/lon. 8 bit Z and V colormap and data scaling added to MetPy from operational AWIPS. According to the ICD for the Product Specification, “the 256 data levels of the digital product cover a range of reflectivity between -32.0 to +94.5 dBZ, in increments of 0.5 dBZ. Level codes 0 and 1 correspond to ‘Below Threshold’ and ‘Range Folded’, respectively, while level codes 2 through 255 correspond to the reflectivity data itself”. So it’s really 254 color values between -32 and +94.5 dBZ. The ICD lists 16 specific color levels and directs 256-level reflectivity products to use corresponding colors, leaving it the rendering application to scale and blend between the 16 color values, and to make decisions about discrete color changes, apparently. 50 dBZ corresponds to the 16-level color light red (FF6060). 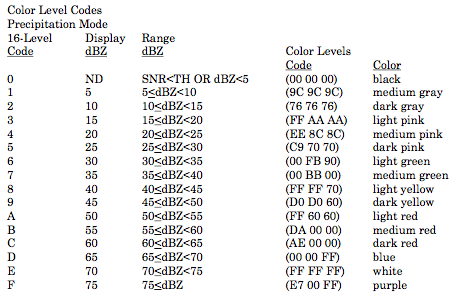 Note that FF6060 is not used in the NWS AWIPS color scale, instead RGB value is given as 255,0,0 (hex code FF0000). 60 dBZ is not quite exactly where white starts, but it makes sense that it would. Obviously the AWIPS D2D authors took some liberties with their 256-level rendering, not adhering strictly to “dark red” for dBZ values between 60-65 (white was for 70 dBZ and above on the 16-level colormap). For this exercise we will assume 50 dBZ should be red and 60 dBZ white, and 75 dBZ cyan. Download this script as a Jupyter Notebook. 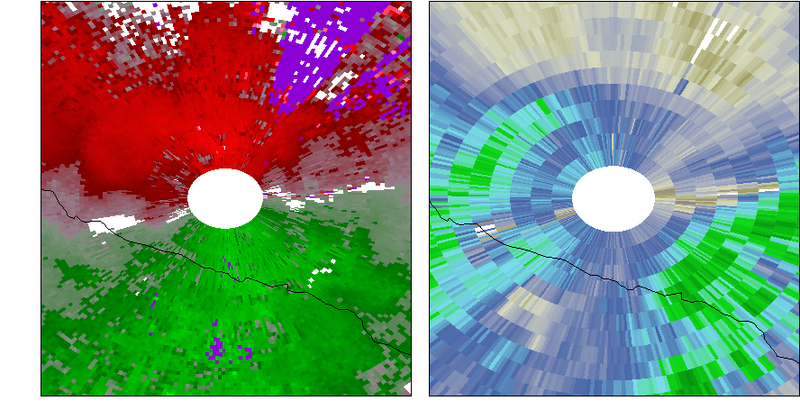 compare with the same product scan rendered in AWIPS CAVE (slightly different projections and still some color mapping differences, most noticeable in ground clutter). I'd love to see more great tutorials like this. Perhaps an "Intro to Python-AWIPS and the Jupyter Notebook Examples" tutorial that goes beyond the python-awips installation steps noted in the documentation. I'm particularly interested in the initial setting up/running of the Jupyter Notebook examples. This was quickly covered in the on-site AWIPS training I attended in Oct 2016, but I'm failing to remember the correct steps for setting it up (including which steps are needed, if any, on an EDEX server and/or CAVE client). Thanks!